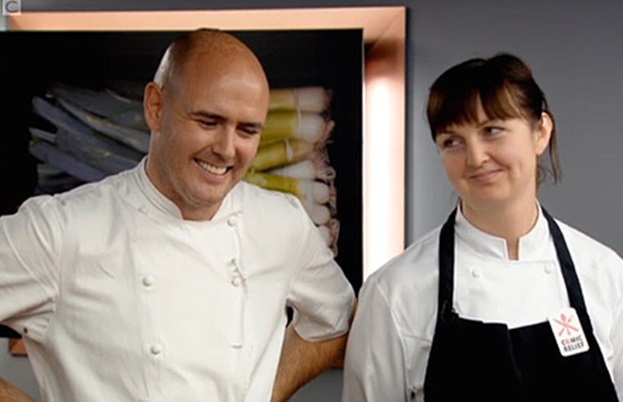 Week three of Great British Menu and chefs from the North West were going head to head. Would Aiden Byrne or Mary-Ellen McTague make it through the tough judging panel to represent their region? 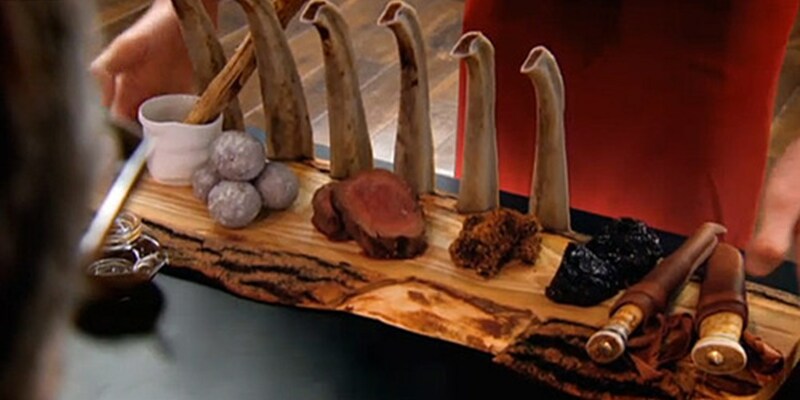 Friday's episode (15th February 2013) of Great British Menu may have seen the closest match yet of the season, with North West chefs Aiden Byrne and Mary-Ellen McTague battling it out in the finals for the perfect menu that marries gastronomy with laugh-out-loud fun. Joining Prue Leith, Oliver Peyton and Matthew Fort on the judging panel was comedy writer, presenter and performer Roland Rivron to weigh in the laughs. And laugh they did with Aiden's first course, "mad as a box of frogs", a modern take on frogs legs with loads of garliccy accoutrements like black fermented garlic, garlic crisps, garlic sauce and garlic coating on the frogs legs. 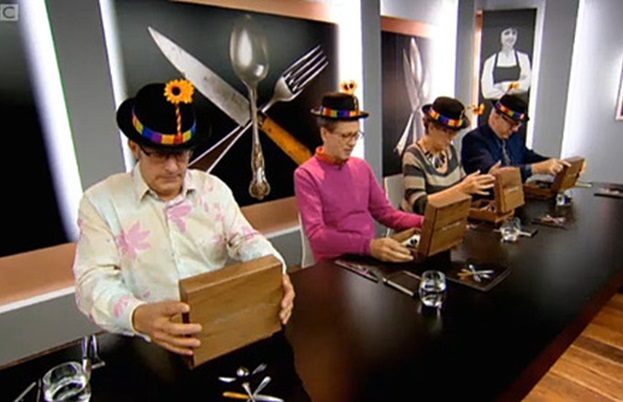 Presented with comedy hats and in a box that "ribbetted" upon opening, the judges did laugh. And critically, they loved the pun-worthy dish, which left Matthew Fort "hopping with hope" for courses to come. Mary-Ellen's starter, "baked bean bath tub", was also praised for its "all too beautiful" presentation of potted crab with beans in a bathtub, little crab sponges and rubber duck jelly. Prue called it "adorable, I love the duck." But unfortunately, the flavours didn't live up to the presentation. Said Oliver: "It's a pity because it's so beautifully conceived but the crab is overpowered." On to the fish course, Aiden's "the culinary joke" (aka prawn cocktail) wasn't a huge hit in the heats, and here it left judges divided. The premise: langoustine powder, golden beetroot, passion fruit dressing, baby leaves, passionfruit horseradish gel, marinated prawns, all served beneath a giant frozen red sphere of passionfruit juice (aka a big red nose). Prue called it "truly horrible...sweet and slimy" to which Roland accused Prue of having a "denture problem". Oliver liked it: "mine is absolutely delicious...this is amazing". This gave Mary-Ellen an advantage with her "dover sole", which sadly she didn't take advantage of in presenting a dish that, though delicious, totally lacked in humour. "This sole has got no rhythm!" said Oliver. Mary picked herself up with the main course, "our kid", which also seemed to bypass the comedy element of the brief, but no one seemed to care: it was that tasty. "The best bit of cooking we've seen today," said Prue. Aiden stepped up with his "long horn beef & noodle pot", an impressive prehistoric display of clay baked potato, onion encrusted ox tail, onion consome, horns full of gravy, BBQ beef fillet, and noodle pots with mechanical twirly forks for eating. Lots of fun. "It looks like a brontosaurus' grave yard," said Matthew, "beyond delight." "I feel like I'm an extra on a Flinstone's film," said Roland. All high compliments, and it tasted "outstanding", too. For dessert, Mary-Ellen returned to comedy with her "chamomile lawn" - a chamomile apricot pudding disguised as a compost bin, served alongside wheely bins filled with syllabub. "She's gone one better than the bath," said Roland. Oliver called it "a beauty". And the flavour even seemed to mimic the multi-layer dimensions of a compost bin. As Prue put it: "it's like an English trifle - the whole point is you keep discovering more and more delights as you go down." Aiden's "the sweet burger" was not so well-received. What looked like a first course was actually a pineapple burger with cream cheese slice, sesame bun and ice cream "chips". "You have to give him a 10/10 for trying... but it's too sweet," said Oliver. Roland agreed: "you have to go have a lie down after this." 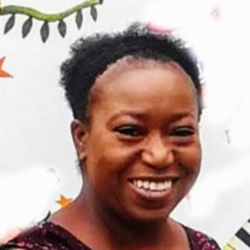 Both Aiden and Mary-Ellen had their hits and misses, but in the end it was a very relieved Aiden, a four-year veteran to Great British Menu, who was announced winner. "It was the longhorn beef dish that really nailed it," said Matthew. But really, who doesn't want to pretend they're on the Flinstone's?